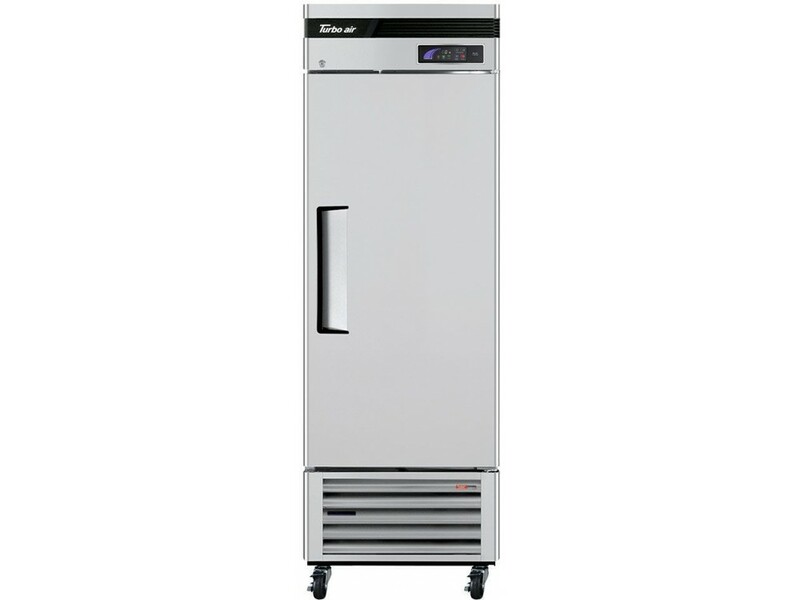 Turbo Air TSF-23SD-N Super Deluxe Series 27" Solid Door Reach-in Freezer | Brittania Food Equipment Ltd. The accumulation of dust in the condenser can cause the failure or breakdown of refrigerators. Refrigerators run normally until they reach a certain level of accumulation. At some point, when they are over the limit, their performance drops quickly resulting in damage to, or disposal of the stored products in refrigerators. The Self-Cleaning Condenser device keeps the condenser clean and prevents system failure by automatically brushing daily. Keep food products safe by maintaining constant temperatures. Alarms that sound when doors are not sealed shut; protect against food spoilage that originate from cold air leaks. Early warning alarm program detects issue before malfunction occurs. Digital display allows for easy monitoring. Programs interpret the condition of refrigeration systems by self-diagnosis. Rapid cool-down function (Turbo Freeze). Smart defrost system will defrost as needed. Automatic evaporator fan motor delays. With innovative and eco-friendly technology, Turbo Air brings you hydrocarbon refrigerators designed to meet the new standards of the EPA and DOE in 2017. Hydrocarbon refrigerants do not deplete the ozone layer and have very low contribution to global warming (ODP-0, GWP-3). The Turbo Air Super Deluxe model boasts a stainless steel interior and exterior (galvanized steel top, bottom and back). It guarantees the utmost in cleanliness and long product life. The sharp corners and edges have been rounded to reduce the risk of injury. The Super Deluxe adds a touch of style to the most refined setting. Shelves are the most important part of cleanliness as they come in direct contact with food. After a while, PVC coated wire shelves may peel, rust and lead to unsanitary conditions. Only the Turbo Air Super Deluxe series uniquely provides stainless steel shelving. Pressure relief doors are designed to eliminates vacuum pressure and allows easy, instant door opening. BUY at any time during the 12 month period and your payout is simply the original purchase price less 60% ofthe rent paid. UPGRADE at any time to equipment better suited for your business. RETURN the equipment after the 12 month period if you no longer need it. EASY OWN at 12 months you can reduce your rental payments by 30% over 36 months and chooseownership at the end of the term for just $1! Numbers based on approved credit. 60% of each payment can be applied to a purchase rebate discount. Guaranteed Approval up to $20,000.